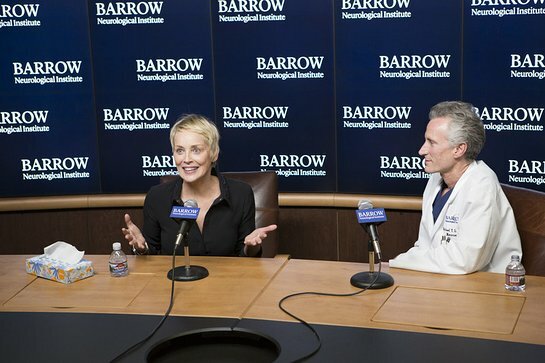 Academy Award-nominated actress Sharon Stone this week visited Barrow Neurological Institute to publicly welcome the Institute’s new leader, Michael Lawton, MD. Dr. Lawton, who succeeded Robert Spetzler, MD, as Barrow’s President and CEO in June, was Stone’s brain surgeon in San Francisco after she suffered a ruptured brain aneurysm in 2001. Stone credits Dr. Lawton with saving her life. Dr. Lawton was recruited to Barrow after an extensive national search that considered many of the foremost names in neurosurgery. He was previously at the University of California at San Francisco (UCSF) serving as vice chairman and chief of vascular neurosurgery in the Department of Neurological Surgery. During a press conference at Barrow, Dr. Lawton announced plans to increase the Institute’s faculty, expand its campus, and grow Barrow’s prominence as the leading neurosciences institute in the United States. During Stone’s visit, Dr. Lawton unveiled his vision for the Institute. The new leader of Barrow outlined his three key initiatives including: transforming Barrow’s home with the addition of an innovative neuroscience workspace in the spirit of “Googleplex,” launching the Barrow Artificial Intelligence Center, and establishing a major research program called the Barrow Aneurysm and AVM Research Center. The goal of this expansion is to bring to Barrow the “same excitement as Google’s headquarters in Silicon Valley, where the most-talented neuroscientists, neurosurgeons, and neurologists in the world collaborate and collide, physically and mentally, to innovate and advance our field,” he said. Dr. Lawton heralded the new Barrow Artificial Intelligence Center, saying it will make the Institute a global leader in developing clinical tools for neuroscientists, as well as better outcomes and possible cost savings for patients. The Institute has recruited one of the world’s leading artificial intelligence medical experts to lead the center and transform the speed and accuracy of neurological diagnosis and treatment. The Barrow Aneurysm and AVM Center will study these two deadly causes of stroke. Barrow is one of the busiest centers in the nation for treating these conditions and has a long history of clinical innovation in the management of these patients. 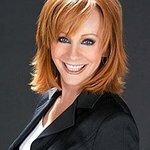 Four top scientists recruited from around the country will form the nucleus of this research team. Dr. Lawton is no stranger to Barrow and Phoenix. Before taking the position at UCSF, he spent his seven year medical residency training at Barrow under his predecessor, Dr. Spetzler, who retired in June. While at UCSF, Dr. Lawton built a prominent cerebrovascular service and amassed a clinical experience in vascular neurosurgery unheard of for someone his age. He has treated more than 4,300 aneurysms, 800 brain arteriovenous malformations, and 1,000 cavernous malformations and is highly regarded by his peers around the globe for his surgical skills, patient care, innovation, and research efforts. Barrow, which performs more brain surgeries annually than any hospital in the United States and is home to the Muhammad Ali Parkinson Center, has long been a world leader in health care and has treated thousands of patients from around the world. It is consistently ranked as a top hospital for neurology and neurosurgery by U.S. News & World Report.